As a proud Aussie and an even prouder supporter of locally owned fashion businesses, I try to do my best to help promote homegrown design talent. Having been privy to the Australian fashion industry through my best friend Belinda Ponczek who studied design at Royal Melbourne Institute of Technology (RMIT) and who went on to launch her own label, I have seen firsthand the hours of work and personal sacrifice that goes in to designing and creating a collection. To ‘make it’ in fashion is tough; the top Australian design schools – like RMIT which was the only Australian university that appeared in The Business of Fashion’s top 20 undergraduate fashion courses, achieving a 9th place ranking – produce many talented fashion graduates each year and there isn’t the corresponding number of fashion design jobs to go around. In addition, fashion schools have a focus on creative design and rarely include business aspects in the course curriculum. Designers graduate without learning key business skills such as how to approach retailers and sell their collections, manage cash flow or market their garments online. Furthermore, the global fast fashion industry – dominated by a handful of international conglomerates – is flooding the local industry with cheap disposable fashion to the degradation of our environment and to the detriment of the workers involved. In essence, Australian fashion designers are having to compete with ‘unethical’ fashion in an industry that is completely unsustainable. Which is why Claire Goldsworthy’s work is valued particularly within the Australian fashion design community. This determined ethical fashion advocate and entrepreneur is the founder of e-commerce store The Dress Collective which exclusively stocks 100% Australian-made fashion and woman behind magazine and blog The Fashion Advocate. With a background in fashion design, launching her own design label Harriette Hill and working with international labels, Claire genuinely understands the struggles that Aussie designers face. She’s experienced it. So to put Australian-made fashion squarely on the map and help other Australian fashion designers, Claire decided an event at this year’s Virgin Australia Melbourne Fashion Festival (VAMFF) would do the trick. This is how The Fashion Advocate Runway was born. The Fashion Advocate Runway will showcase the exceptional creativity and diversity of Australia’s talented designers whilst paying homage to local production and the benefits of ethical manufacturing. The aim is to educate consumers on the power of voting with their fashion dollars as well as stimulate conversations about what it means to support local designers and fashion businesses. VIP tickets have now sold out but there are general admission tickets still available. Cost is $58.73 per ticket. You can get yours here. Event goers who were fortunate enough to to secure VIP tickets will enjoy a premium seated view of the runway, as well as a VIP gift bag full of Australian made fashion and beauty goodies and discounts from event supporters including: Remedy Kombucha, Runway Room, Timber and Cotton, Aura Makeup, Angel Aromatics, Mr G Texture Gel, The Kind Coffee Co, Bonfire Candle Co, Harlow and Fashion Equipped. Knowing how influential she is in our fashion community and how hard she has worked to produce this event, I have a sneaking suspicion Claire will get her wish. 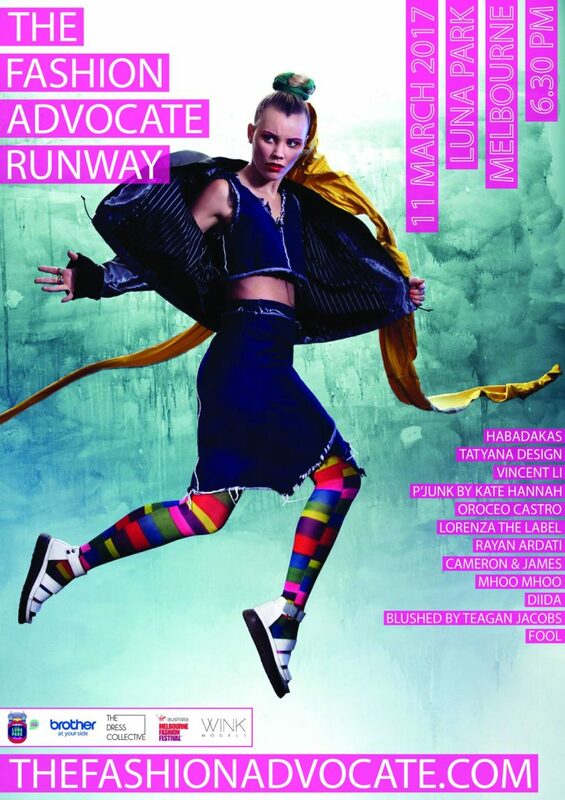 If you’re in Melbourne and want to support Australian design talent, make sure to get your tickets to The Fashion Advocate Runway here. Ticket proceeds will be donated to White Ribbon Australia, Australia’s only national male-led violence prevention campaign to stop men’s violence against women.